Some people would have you believe that gambling is one giant scheme, and that anyone who chooses to gamble is a fool. Others would have you believe that with the right system you can easily make a substantial amount of money. These are two extreme views on gambling, neither of which are even close to being accurate. There are lots of other misconceptions about gambling too, many of which are quite commonly held. A lot of people genuinely believe that it can only lead to addiction and financial ruin or that it's an anti-social activity that should be discouraged. Some people think that all forms of gambling are fixed so that you can't possibly win, and some think that they are all based entirely on luck. None of these things are true either. 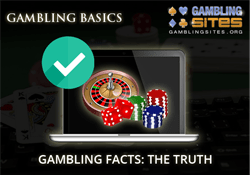 There may be a grain of truth to some of them, but they are ultimately incorrect nonetheless.The problem is that so many of these mistaken beliefs are repeated often enough that some people have the completely wrong idea about gambling. We would never suggest that gambling is right for everyone, but it's ridiculous to make it out to be some kind of evil activity that should be avoided at all costs. It's equally ridiculous, of course, to suggest that gambling is an easy way to gain wealth and prosperity. The real truth lies somewhere in between. If gambling is something you're interested in, you should know the truth before deciding whether it's an activity you want to try or not. That's why we've written this article. In our opinion there are a few key facts that you really need to know, and we discuss each one of these below. There's more to gambling than the money. Every gambler wants to win money if they can, but it's not the most important thing for everyone. For many, gambling is seen as a form of entertainment where any money they happen to win is a bonus. The chance of winning money is a big part of what makes gambling so entertaining of course, but the point is that it can be a lot of fun regardless of whether you win or lose. This is something that a lot of people fail to understand. They assume that losing money at gambling is always a big deal, when in reality most people view it the same as they would any other entertainment cost. Is spending a few bucks in exchange for a couple of hours of fun in the casino really any different to spending a few bucks to go watch a movie? Contrary to the opinion of some people, gambling can be a very sociable activity. The idea that all gamblers are ashamed of what they do and want to keep it a secret is complete nonsense. A lot of people do choose to gamble on their own for sure, but not necessarily because they are being secretive. It may simply be their preference. In any case, there are also a lot of people that choose to gamble with their friends. For example, many people enjoy playing poker at home with their friends or taking a trip with them to spend the weekend at a nearby casino. Taking a group trip to the horse racing track is a great way to spend a Saturday or you can even have fun by placing a small bet against a friend on the outcome of an upcoming sporting event that you watch together. All of these examples add a social element to gambling, and there are even more ways to do so. A very common assumption about gambling is that it's purely luck that determines whether or not you win. This is certainly true of some forms of gambling, such as lottery games for example, but it's not always the case. The very nature of gambling means that there's always some element of luck involved, but skill and strategy have their place too. Poker and sports betting are great examples of this. The best poker players in the world don't get to be the best by getting lucky, it's because they study the game and learn how to outplay their opponents. In the same regards, the best sports bettors in the world don't make money solely because they are lucky. They know how to gain an edge against the bookmakers by utilizing their sports knowledge and betting skills. There's strategy involved in some casino games too, even though they are games of chance. Luck is the overriding factor, but it's not the only factor. If you play the right way you can at least have some effect on your overall chances of winning. This is really just an extension of the previous point. Not all gamblers are doomed to lose money, and indeed there are some who make a very nice income from their gambling activities. Technically, it's possible for anyone to be profitable, providing they know what they're doing. This is only true for some types of gambling though. You can't be profitable in the long run when playing casino games for example (unless you learn how to count cards), as there's a house edge which ensures the odds are always against you. You may win in the short term, but the laws of probability mean you are almost certain to lose money eventually. With forms of gambling such as poker and sports betting, however, you can put the odds in your favor. As we mentioned earlier, these involve a significant amount of skill and strategy. If you can master the necessary skills and learn the right strategies, there's no reason why you can't consistently make money. Every time you place a wager, enter a poker tournament, put your chips down in the casino, or do any kind of gambling, you're taking a risk. The very essence of gambling is that you're effectively betting on an uncertain outcome, so there's always a risk that the outcome isn't a favorable one. Even a very skilled poker player won't win every single hand they play. Likewise, a skilled sports bettor won't win every single bet they place. There is always a risk of things not going as expected, and it's very important to remember this. We've already explained how it's perfectly possible to win money from gambling. However, it's also important to keep in mind that most gamblers do lose. Realistically the chances are that you will too, and you should certainly be prepared for that possibility. You might have what it takes to become a successful poker player or a profitable sports bettor, but it's unlikely that you'll start winning from the moment you start. We're not saying this to steer you away from gambling. We just want you to be aware of the fact that losing is a distinct possibility. If you only ever gamble with money that you are happy to lose, then losing isn't a huge ordeal. The final fact we want to make you aware of is that gambling can be addictive. As such, if you happen to have an addictive personality you should seriously reconsider whether gambling is the right activity for you. A gambling addiction can be very destructive, and it's something you definitely want to avoid. Again, we're not saying this to put you off gambling. Most people are able to enjoy gambling without it becoming a problem, and the chances are that you can too. With that being said, we feel very strongly about the importance of responsible gambling and we believe that everyone should be aware of the potential pitfalls of gambling before taking it up as a pastime. If you would like more information about gambling addiction, including info on how to get help, please read this article.